The Floating Village and Port of Chong Khneas are located less than 15km from Siem Reap. It is the perfect place to visit on the Tonle Sap Lake for those who don't have the time to explore Prek Toal or Kompong Phluk. The Boat Half Day Tours of Chong Khneas will begin at 8.00 AM - 11.00 AM respectively, when we pick you up from your Hotel or Guesthouse in an air-conditioned vehicle. Our friendly and knowledgeable tour guides speak English (and Khmer of course), and they will ensure that you enjoy your tour, pointing out areas of local interest along the way and answering any questions you may have. It takes about 20 minutes to reach the port of Chong Khneas, and upon arrival we will exit the vehicle and jump onto one of the Mini boats with life jackets and driven by experienced and safe local drivers. On route to the boat we will make two stops. The first will be the big fresh ocean, which provides a whole view of the sky and connected to the ocean & unique ecology of the Tonle Sap. The second stop will be the Crocodile & Fish Farm at Chong Khneas. If catfish, crocodiles and large snakes don't interest you, there is a souvenir shop and a viewing deck on board for you to purchase some presents for loved ones or take a few photos. 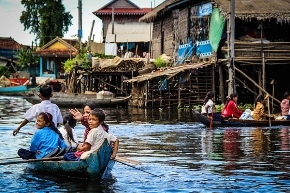 The boat ride through Chong Khneas will allow you to see ordinary Cambodian going about their daily life in the floating village. Fishermen, boat-makers, markets, schools, spirit houses and waving children are always in plentiful supply on this mesmerizing scenic route, and it is not uncommon for the scenery of Chong Khneas to provoke silence on the boat, as customers take in the sights and sounds that surround them. Ø Free hotel pickup and drop-off included. Ø Enjoy a day away from the hustle and bustle of the city. Ø Informative, friendly and professional guide. Ø All transport to/from hotel in AC Minivan/car. Ø All check point fees. Ø Children must be accompanied by an adult. Ø A moderate amount of walking is involved. Ø Due to uneven surfaces, this tour is not recommended for those with walking disabilities or using a wheelchair. Ø Operates in all weather conditions, please dress appropriately. Ø There will be opportunity to swim so please bring swimwear if desired. Ø Comfortable shoes highly recommended. Ø We advise that both male and female visitors to the Temple cover to their elbows and knees or risk refusal of entry, due to the complex being a highly religious site. Ø Confirmation will be received within 24 hours of booking, subject to availability. Ø Children 10 or under, half price. 5 or under FREE. Ø A minimum of 2 people are required for this tour. Ø Hotel pickups commence prior to start time of tour. You will be allocated a pickup time on confirmation of booking. Ø Pickup times are subject to slight change due to local traffic conditions. Ø Gratuity is not included and is left to individual discretion. Ø Please pay the guide at the start of the tour. Ø Hotel information required on booking. Ø All traveler names required on booking. Enjoy this fascinating tour that will take you back in time to the beginnings of the ancient Khmer Empire in 802 AD, proclaimed independent at this Holy Mountain, which started the so-called "Angkor Period". Our guide will show you the many historic ruins including Linga stands. Once you get picked up by your guide at 08:00AM in Siem Reap, you will head off to the Kulen mountain, in an AC minivan/car. Along the way you will see beautiful scenery including rice paddies and rural Cambodian villages where you can observe the locals in their daily lives. 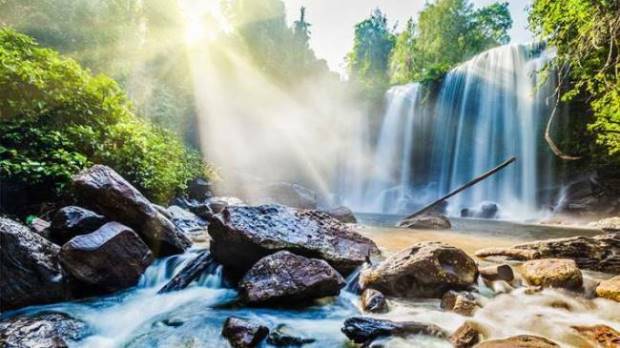 Phnom Kulen is an isolated chain of small mountain plateaus, of moderate height, lying south of the Dângrêk Mountains. The range stretches for about 40km in a West North West - East South East direction and is located some 48km north of Siem Reap. Its highest point is 487m and its height is quite regular, averaging 400m all along the range. Geologically, Phnom Kulen is formed of sandstone. It was important as a quarry in Angkorian times, the major quarries being located in the southeastern angle of the massif. 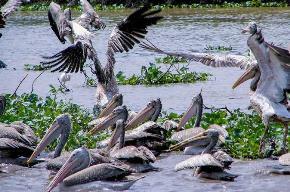 This site was added to the UNESCO World Heritage Tentative List on September 1, 1992 in the Cultural category. On arrival at Kulen Mountain you will begin to climb up the path through jungle. 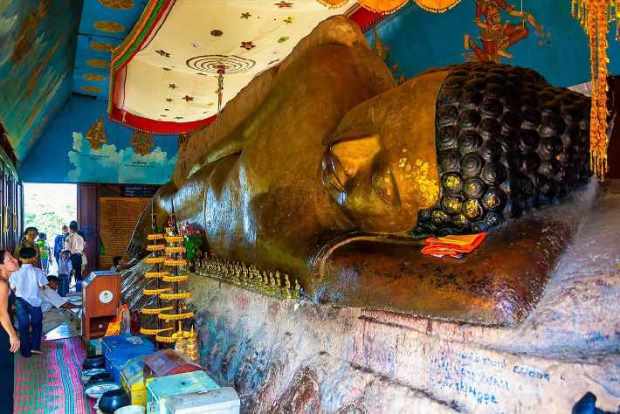 Your guide will stop along the way to point out the many points of interest, including the ancient ruins of temples including the famous Linga river carvings, or a Pagoda on the mountain, before getting to chill in the waterfall and swim in the pools, while contemplating the crucial moment in history that this place is connected to. It also has a major symbolic importance for Cambodians as the birthplace of the ancient Khmer Empire, for it was at Phnom Kulen that King Jayavarman II proclaimed independence from Java in 804 CE. He initiated the Devaraja cult of the king, a linga cult, in what is dated as 804 CE and declaring his independence from Java of whom the Khmer had been a vassalage state (whether this is actually "Java", the Khmer chvea used to describe Champa, or "Lava" (a Lao kingdom) is debated, as well as the legend that he was earlier held as a ransom of the kingdom in Java. During the Angkorian era the relief was known as Mahendraparvata (the mountain of Great Indra). After you have experienced the historical beauty of Kulen you will stop for lunch and drinks before returning to your accommodation in Siem Reap.